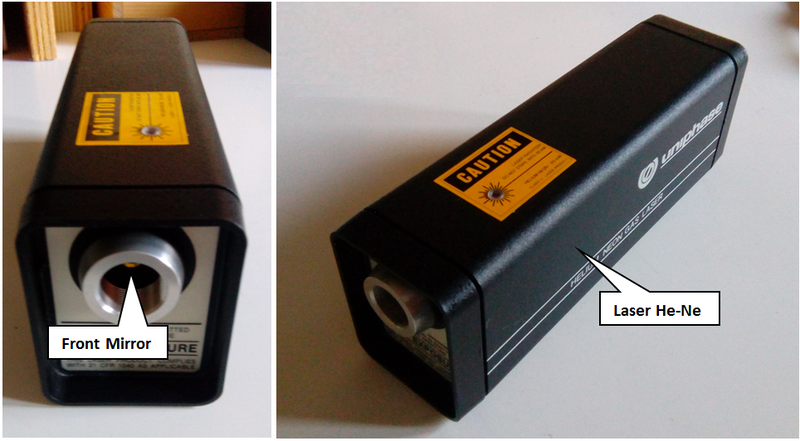 Finally at PhysicsOpenLab the Helium–Neon Laser has arrived ! A helium–neon laser or HeNe laser, is a type of gas laser whose gain medium consists of a mixture of 85% helium and 15% neon inside of a small bore capillary tube, usually excited by a DC electrical discharge. The best-known and most widely used HeNe laser operates at a wavelength of 632.8 nm, in the red part of the visible spectrum. 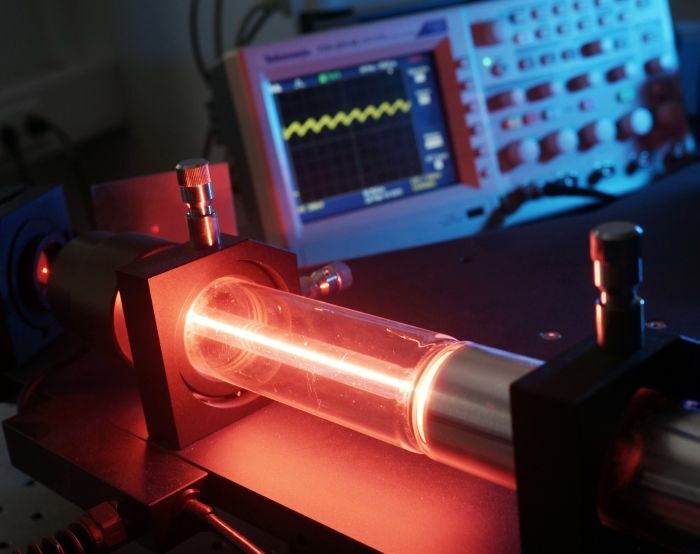 The gain medium of the laser, as suggested by its name, is a mixture of helium and neon gases, in approximately a 10:1 ratio, contained at low pressure in a glass envelope. The gas mixture is mostly helium, so that helium atoms can be excited. The excited helium atoms collide with neon atoms, exciting some of them to the state that radiates 632.8 nm. Without helium, the neon atoms would be excited mostly to lower excited states responsible for non-laser lines. A neon laser with no helium can be constructed but it is much more difficult without this means of energy coupling. Therefore, a HeNe laser that has lost enough of its helium (e.g., due to diffusion through the seals or glass) will lose its laser functionality because the pumping efficiency will be too low. The energy or pump source of the laser is provided by a high voltage electrical discharge passed through the gas between electrodes (anode and cathode) within the tube. A DC current of 3 to 20 mA is typically required for CW operation. The optical cavity of the laser usually consists of two concave mirrors or one plane and one concave mirror, one having very high (typically 99.9%) reflectance and the output coupler mirror allowing approximately 1% transmission. Commercial HeNe lasers are relatively small devices, among gas lasers, having cavity lengths usually ranging from 15 cm to 50 cm (but sometimes up to about 1 metre to achieve the highest powers), and optical output power levels ranging from 0.5 to 50 mW. The figure below shows the principle of the laser, with the optic cavity delimited by the two mirrors and the plasma tube containing the helium-neon gas mixture, and inside of which the electric pumping discharge occurs. The images below show our laser. This is a Uniphase equipment, model 1508P-0 with a beam power of 0.8 mW. It is powered by 12 Vdc and is equipped with power switch and indication LED. The output beam is 0.48 mm TEM00 and with a divergence of 1.7 mrad, the emission is centered on the wavelength of 632.8 nm, the beam is polarized. The mechanism producing population inversion and light amplification in a HeNe laser plasma originates with inelastic collision of energetic electrons (from discharge) with ground state helium atoms in the gas mixture. As shown in the accompanying energy level diagram, these collisions excite helium atoms from the ground state to higher energy excited states, among them the 23S1 and 21S0 in long-lived metastable states. 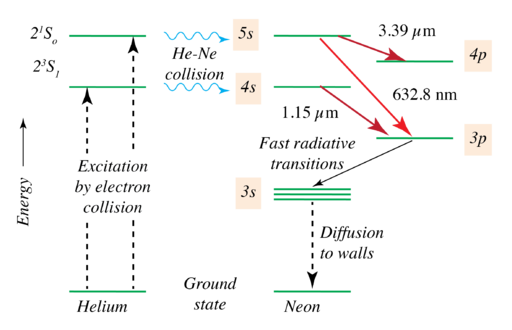 Because of a fortuitous near coincidence between the energy levels of the two He metastable states, and the 5s2 and 4s2 levels of neon, collisions between these helium metastable atoms and ground state neon atoms results in a selective and efficient transfer of excitation energy from the helium to neon. Excitation energy transfer increases the population of the neon 4s2 and 5s2 levels manyfold. When the population of these two upper levels exceeds that of the corresponding lower level neon state, 3p4 to which they are optically connected, population inversion is present. The medium becomes capable of amplifying light in a narrow band at 1.15 μm (corresponding to the 4s2 to 3p4 transition) and in a narrow band at 632.8 nm (corresponding to the 5s2 to 3p4 transition at 632.8 nm). The 3p4 level is efficiently emptied by fast radiative decay to the 1s state, eventually reaching the ground state. With our grating spectrometer we acquired the emission spectrum of helium-neon laser. In the pictures below, you can see the line at 633 nm wavelength of the laser emission. 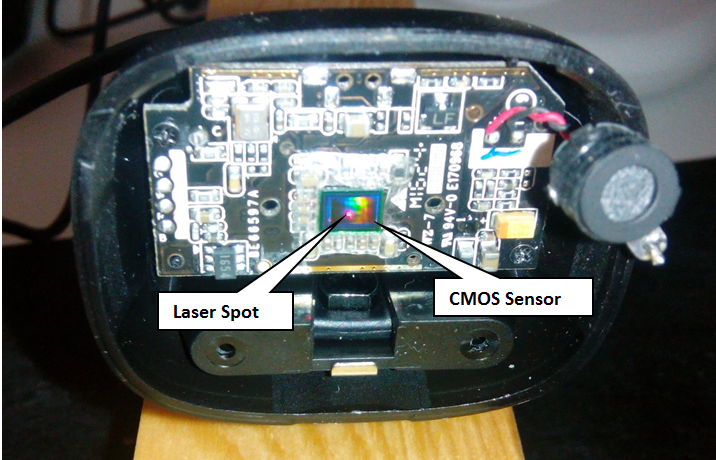 To measure the transverse beam profile emitted by our He-Ne laser we used an innovative method, albeit somewhat inaccurate, based on the CMOS sensor of a webcam. 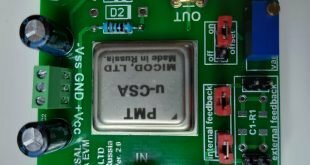 The image to the side shows a webcam (in our case the Microsoft Lifecam 3000), dismounted, in which the CMOS sensor was exposed. In practice, it is about directing the laser beam directly onto the CMOS sensor and recording the image that is formed to measure the transverse beam profile. If the beam is too intense and the sensor is brought to saturation it will be necessary to reduce the intensity with suitable filters, in our case we have used polarizing filters. Of course the measure you get is mainly qualitative, but it may be enough to distinguish the dominant mode of the beam. The image below shows the experimental setup with webcam and laser source. In the image below you see the laser beam spot as it is captured by the webcam, while to the right is reported the transverse beam profile as is obtained by the pixel intensity analysis. You see how the trend is well approximated by a Gaussian curve and the dominant mode of transverse oscillation is a TEM00, although there may be a decrease in intensity at the center of the beam. For the image processing we utilize the open software ImageJ.